If you are beset with fear and anxieties, stand up right now and pray: your soul will find comfort and solace. The prayer — as long as you perform it sincerely with a wakeful heart — is guaranteed to have this effect for you. Theprayer was his joy and pleasure; it was the delight of his eye. I have read biographies of many righteous people, who would always turn to prayer when they were surrounded by difficulties and hardship, people who would pray until their strength, will, and resolution returned to them. The Prayer of Fear (which is performed during battle) was prescribed in situations wherein limbs are severed, skulls fly, and souls depart from their bodies — a time when strength and resolution can only be derived from heartfelt prayer. This generation, which is consumed by psychological sicknesses, must return to the Mosque, going there to perform prostration and to seek Allah’s pleasure. If we do not do this, tears will bum our eyes and grief will destroy our nerves. By earnestly performing the five daily prayers, we achieve the greatest of blessings: atonement for our sins and an increase in rank with our Lord. Prayer is also a potent remedy for our sicknesses, for it instills faith in our souls. As for those that keep away from the Mosque and away from prayer, for them are unhappiness, wretchedness, and an embittered life. 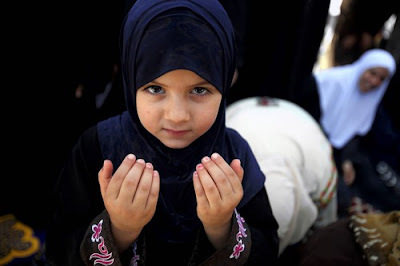 A Palestinian Muslim girl looks on while praying with her mother during the first Friday prayers of the holy fasting month of Ramadan, in the Al-Aqsa Mosque compound in Jerusalem's Old City, Friday, Aug. 28, 2009. Muslims throughout the world are celebrating the holy month of Ramadan, where observants fast from dawn till dusk.